What Are You Missing From Milk? 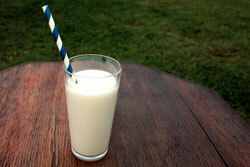 | Allergychoices, Inc.
Food Allergy/What Are You Missing From Milk? 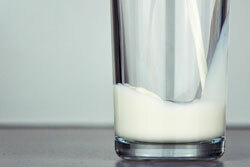 Have you heard the recent buzz about rising milk allergies in the U.S.? For those with a milk allergy, it’s important to replace the nutrients taken away when eliminating milk with alternatives. Here you’ll find milk’s essential nutrients, the importance of milk in the human diet, and alternatives to milk. Cow’s milk is the usual cause of a milk allergy, but milk from goats, sheep, buffalo and other mammals can also trigger a reaction. The two major proteins in cow’s milk are whey and casein. Whey is found in the liquid part of milk and casein is found in the solid part (curd) of milk that curdles. Cow’s milk is a good source of protein, with each cup delivering about 8 grams. In America, milk and dairy products are a top source of calcium in the diet, one cup providing 290 mg of calcium. Critical for many body functions such as nerve conduction, muscle contraction, blood clotting, and membrane permeability, calcium is most known for its role in bone formation and health. Other essential nutrients in milk include phosphorus, riboflavin, pantothenic acid, potassium, as well as vitamins B12, A, E, and D. Milk provides a significant amount of calcium and vitamin D, which are not so readily available, or absorbed, from any other source. Vitamin D promotes calcium absorption in the body and maintains adequate serum calcium and phosphate concentrations to enable normal mineralization of bones. It’s a fat-soluble vitamin naturally found in fish, fortified in common foods such as milk, as well as being available as a dietary supplement. Our bodies also produce vitamin D when ultraviolet rays from sunlight strike the skin. For people with multiple food allergies, sufficient calcium and vitamin D may be difficult to obtain from food sources alone, so in some cases, supplements of these micronutrients are required to ensure optimum nutrition. Milk is a unique food in human nutrition for several important reasons. It’s the indispensable first food of the newborn infant. Ideally, the first milk a baby ingests is its own mother’s milk; if not possible, human milk may be available from a donor. The next recommended option is milk-based infant formula. Formula manufacturers try to imitate human milk as closely as possible in order to supply all the known nutrients required for the baby’s optimal growth and development. When an infant has a milk allergy, there are specialty allergy-free formulas available to ensure adequate nutrition and growth without dairy. In children and adults with a milk allergy, it’s essential to obtain alternate sources of all the nutrients in milk. Luckily, these nutrients can still be obtained through other foods and beverages while following a milk-free diet. Today, there is an abundance of fortified non-dairy beverages such as soy, almond, cashew, oat, coconut, rice, hazelnut, hemp, pea, quinoa, and flax milks. Keep in mind that not all plant-based milk brands and styles are created equal. There are various choices including sweetened and unsweetened, vanilla or chocolate, added protein or original, and so on. Reading the Nutrition Facts and product labels will help you select the best alternatives that provide protein, calcium and vitamin D to your diet. When comparing non-dairy substitutes to cow’s milk, the most important nutrients to look at are calcium, fat, and protein. Most non-dairy substitutes will be fortified, which means nutrients have been added to the product. The Dietary Guidelines recommend including non-dairy food sources in the diet that are rich in calcium such as green leafy vegetables, broccoli, salmon, soybeans and soy products, black and navy beans, and fortified breads, cereals, crackers, and beverages for children and adults avoiding milk. Two to three servings of fish per week are recommended for supplying adequate vitamin D to your diet, too. Consuming protein-rich foods such as meat, poultry, fish, legumes, nuts and seeds can provide adequate protein while on a milk-free diet. Whether you or your child is avoiding milk, there are plenty of non-dairy options to supplement those missing nutrients. Cow’s Milk Allergy in Children. WAO. Dairy Alternatives for Kids Who Won’t – or Can’t – Drink Milk. Eat Right Academy of Nutrition and Dietetics. Milk allergy. Mayo Clinic. June 2018. Vickerstaff Joneja J. The Health Professional’s Guide to Food Allergies and Intolerances. Academy of Nutrition and Dietetics; 2013.